APG Defender Dummies for Soccer. 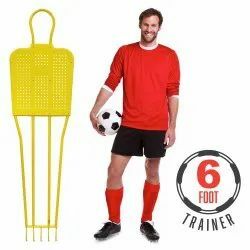 - INCREDIBLY STRONG: This heavy duty soccer dummy is built to take the brunt of repeated strikes. Worlds best grappling Wrestling dummy. We have widest range of dummies in the world. Wrestling dummies made of high quality synthetic leather, hand sewn and stuffed to perfection. Ideal for full out training sessions without the risk of injuring the training partner. The dummy weighs approximately 120lbs. and stands 5' 10"
Football practice dummy PVC MADE. - Also called up as free kick training mannequins. - Sturdy steel tube construction. - Spike at the base for insertion to ground. - Available with mesh frame or heavy duty nylon fabric. The flexible and durable wrestling dummies are great for perfecting take-downs and throw. Realistic leg and arm positions help you practice the intricacies of the sports and train without risk of injury. Constructed from soft and durable synthetic leather. Matching up with the requirements of our clients, we are involved in offering Standing Wooden Dummy.